Hi! Chris here. Remember me? I blog here but disappear for long stretches to swim in the Mediterranean Sea. 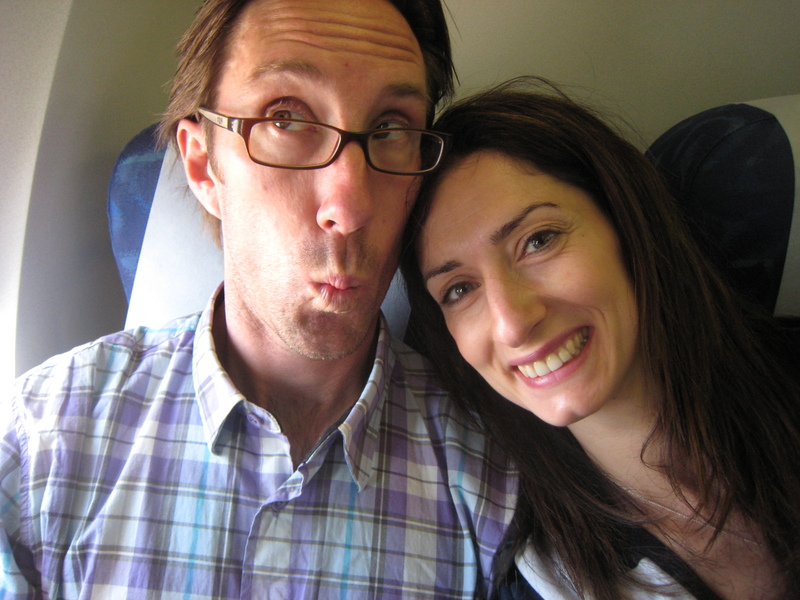 Yep, that’s me with the boy, on an airplane somewhere over France. Our vacation was perfect. 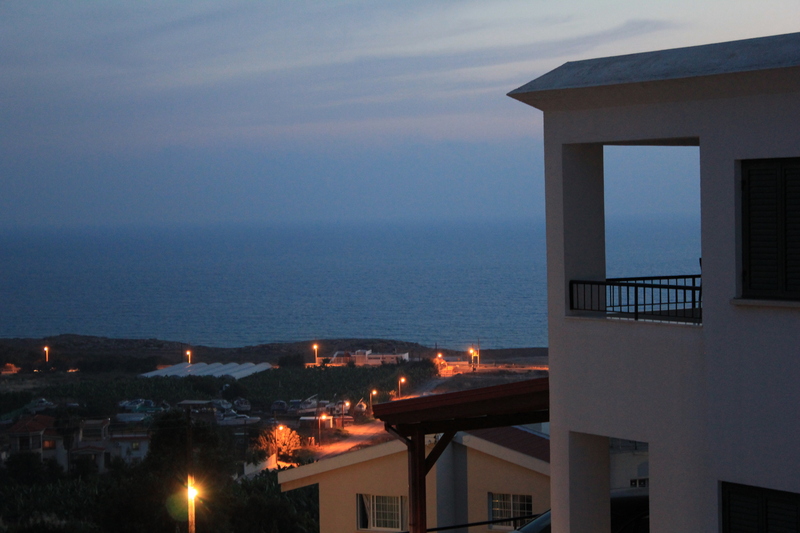 The days went, more or less, like this: wake, eat breakfast on balcony overlooking sea, make sandwiches, go for hike, follow with swim and beach time, force boy join me on pre-dinner run and then we eat dinner at home, again on balcony overlooking the sea. The restaurants on Cyprus are very good. But the grocery stores and markets are incredible. Almost all the produce is grown locally, the fish caught in the waters right not far from our house. As soon as you enter the shops, you’re hit by the smell of fresh tomatoes, parsley and garlic. 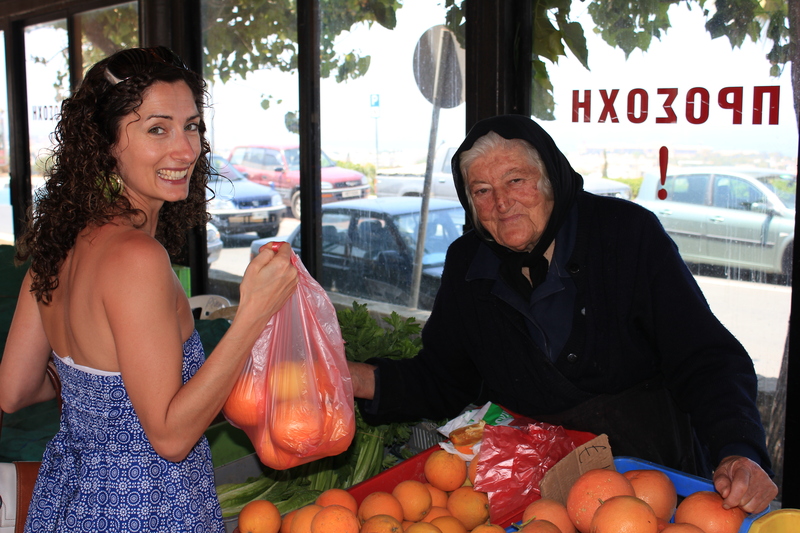 If the smells weren’t enough, there’s nothing quite like buying fruits from an old town market. Because I’m bossy in the kitchen, the boy usually set the table and sat outside, drinking one of these local beers and recovering from our run. 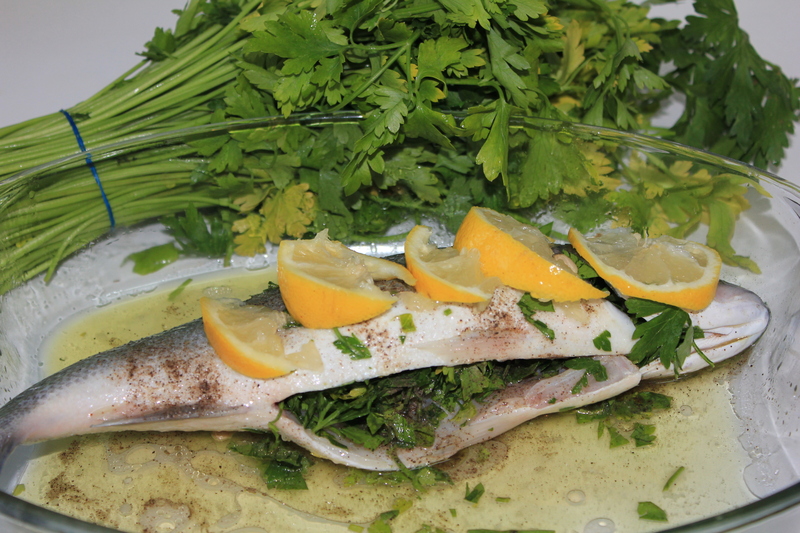 One of my favourite Cyprus meals is fresh seabass, covered with lemon and stuffed with parsley, then BBQ’ed (if available) or baked in the oven. And if you laugh at my poor hacked-at lemons, go away and read a different blog. I was working with dull knives that I bought eons ago when I was a university student. 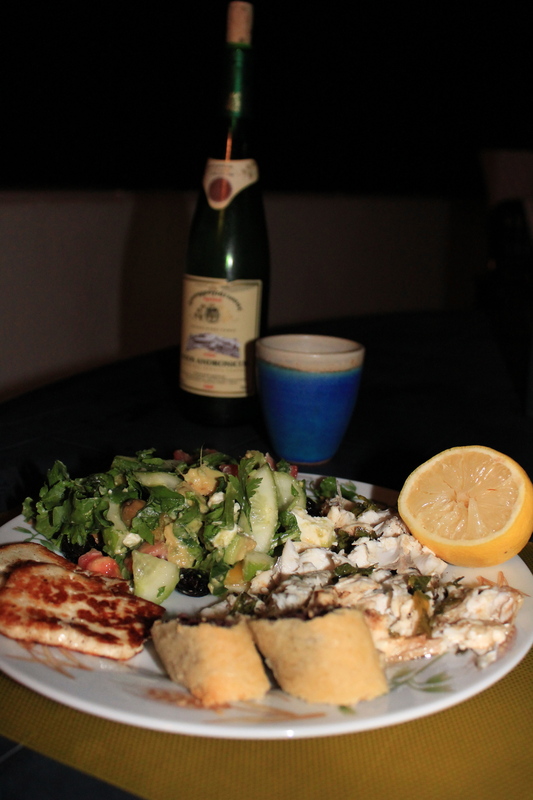 We had seabass twice, paired with salad and squeaky fried halloumi cheese (more on squeaky fried cheese another time, I promise). 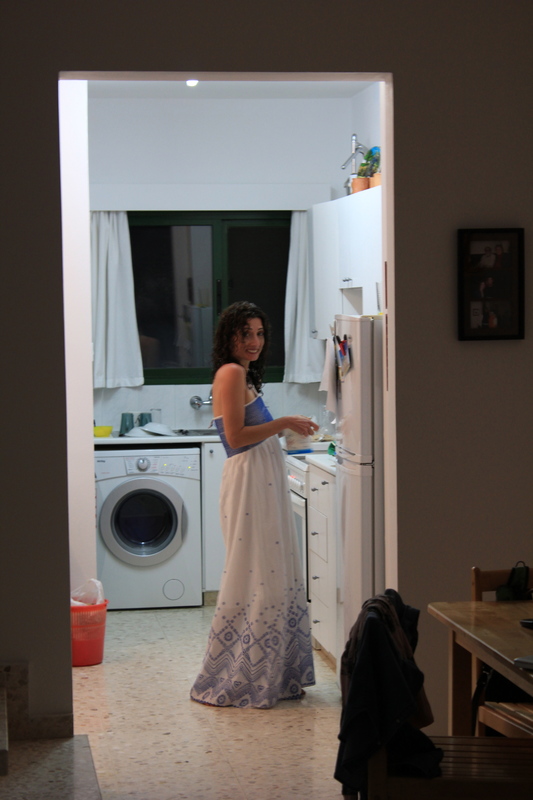 I used to make this for my sister when she and I lived out in Cyprus together. I know it’s one of her faves. She’s heading back to the island with her husband later this year. So, Nic, here you go! Place the fish in a baking pan or ceramic baker. Season them with salt and pepper. Stuff with parsley and garlic. The more parsley, the better, I figure. Combine oil, lemon juice and wine and pour over fish. Cover fish with slices of lemon. Bake the fillets uncovered for 45 -50 minutes or until the fish flakes easily with a fork.